Tonight I finally got around to juicing all the passion fruit we have been collecting for the past week. Look at that color! It almost looks synthetic instead of something from nature. I made the juice the same way as I did the guava in an earlier post. Click here for the how to. Here in Hawaii, passion fruit is called lilikoi and is normally eaten raw... seeds and all. It is egg shaped and about the size of a lemon. you know it's ripe when it falls from the vine and gets all wrinkled. Lilikoi flavored syrup is a popular topping for shave ice. We love mixing it it with ginger ale and have used it on top of coconut ice cream. 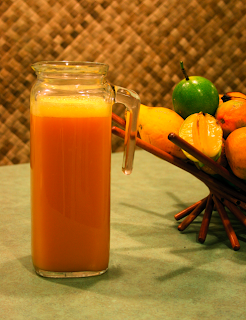 A lot of fruit are needed for a little juice, but a little juice goes a long way. We usually use about 3 teaspoons per glass of ginger ale. We must have had about 40 in all and I think this juice will last us awhile. YUM! Tomorrow I might try making tapioca with coconut milk and lilikoi... we had plain coconut flavored version here that made our eyes roll back in our heads. Lilikoi are not widely available in stores, so most of the fruit eaten comes from backyard gardens or wild groves. We have 2 vines that grow out of control and I could not be happier. One a purple version and another one is yellow. I am actually trying to get more to grow, but I need to make a trellis for them to grow on so they do not choke out the trees.